I’ll be out-of-pocket for a little while. I’m going on a family vacation to Honolulu, Hawaii. I know it’s more fashionable to go to the more remote islands but Waikiki Beach works great for us. There’s a lot to do for the family and the city like environment gives me things to shoot. I, not being a nature photographer, will probably get board just taking pictures of palm trees. Whenever I take these trips, the inevitable question is, what gear do I bring? You know that I have enough cameras that I try to tailor my gear to the occasion. So this is what I decided. 1. I’m bringing the Olympus TG-2 water proof point and shoot. I got this last year before my Cancun trip and it will be my main camera on the beach and in the water. 2. The Fujifilm X100S is going to be my main documentary camera (when I’m not playing on the beach). I’ve been happy with the fixed 35mm equivalent lens and it’s my highest quality camera. 3. The Olympus E-PM2 with the Panasonic 14mm f2.5 plus wide-angle adapter is also coming along. Yup, you guessed it. This is going to be my HDR, urban landscape camera, to be shot on tripod. I’m also bringing the small 14-42mm kit lens, just in case. 4. I’ll also bring the MacBook Pro, my light-weight tripod and all the other miscellaneous accessories that are required. The miscellaneous stuff actually takes up a fair amount of space. That includes the 3 camera chargers, the big charger for the MacBook Pro and extra batteries. I’ve travelled enough now to know that every extra bit slows me down. Bring enough things and it becomes a boat anchor and diminishes the pleasure of traveling. Everything I mentioned, except the tripod, fits nicely in the Tenba Small Messenger. I love this camera/computer bag. I use it to travel around the world. I’ll need to do a proper review of it someday. I don’t check anything in. My small tripod fits inside my roller board. So I have two carry-ons. That’s the way I travel for business too. When I’m whisking through the airport, I just put the Tenba Messager on to of my roller board. Perhaps by luck, the metal handle of the roller board fits through the Tenba’s handle. That keeps it securely on top. The total weight of the Tenba plus gear, 14 pounds. That might sound like a lot but on my previous trip to Hawaii in 2010, my photo gear weighed a whopping 25 pounds. Back then I shot the Canon 7D DSLR along with several lenses including the 70-200 f4 L. I stuffed everything in a LowePro backpack. I’m working to make this even lighter. The newer MacBooks weigh several pounds less than my old unit. So, someday…. I took the photo up top back in 2008 with the Canon Rebel XT and a 28-135mm lens. Despite the fancier gear 2 years later, none of the photos had the right combination of light and expression as this one. It’s my favorite Hula photo. Now, in 2014, I’m shooting differently. No long and heavy telephoto lenses. No big DSLRs. I’m mirrorless and getting up close to people. I could bring my light-weight telephoto but I’m not going to bother. 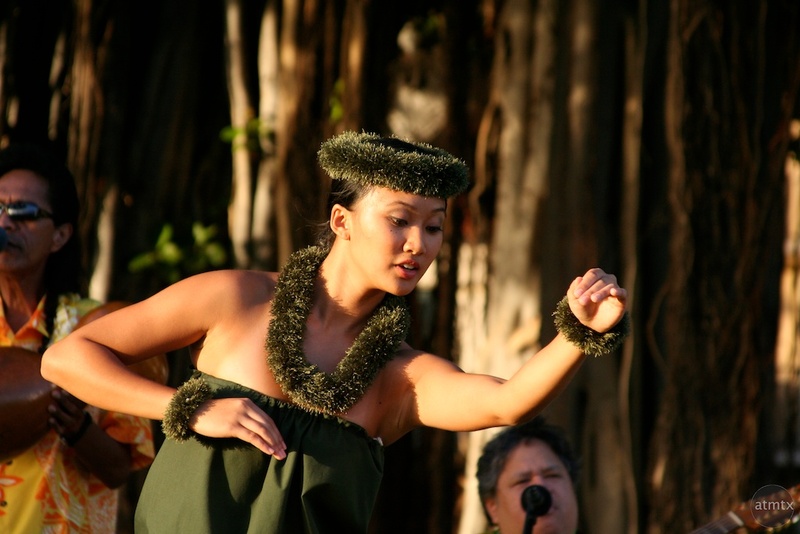 I never ended up posting any of the Hula photos I took in 2010. Perhaps they weren’t as important as I imagined.